QbD > Blog > Market introduction of new medical devices: submit under MDD or MDR? Countries rely on the use of medical devices to achieve universal health coverage, respond to health emergencies and keep populations safe. We see companies designing and developing more and more devices and trying to find their way to a market approved status. Among others, this market strategy has to take into account important things like the ISO13485:2016 standard, CE-marking of the product, FDA approval and many more. And since the new Medical Devices Regulation (MDR) will take effect in 2020, the process is getting even more complex. No wonder all medical devices stakeholders want to jump aboard this approaching train. Although seemingly far away, the train is coming and it’s coming fast. The new MDR (EU) 2017/745 will replace the current Medical Devices Directive (MDD) 93/42/EEC and the Active Implantable Medical Devices Directive (AIMDD) 90/385/EEC. These directives have been in place for over 25 years now and have been the basis for the single market for medical devices in Europe. They also defined the way to CE certification. However, too much room for interpretation, technological innovations and some illustrious scandals have proven the need for more stringent and updated regulations. The MDR entered into force on 26 May 2017, starting a three-year transition period. The Date of Application (DoA) of the MDR is 26 May 2020. By then, every medical device manufacturer must comply. Important players and experienced medical devices manufacturers are making significant efforts to be fully prepared for the transition and to recertify all their products on the market before the DoA. However, start-ups that want to enter the market with their new products in the coming years, are confronted with the decision whether to still file for submission under the MDD or file under the more stringent MDR. The timing for market entry is crucial: submissions after 26 May 2020 will no longer be accepted by the notified bodies under MDD. The availability of quality and regulatory resources and the strategic business plan will mostly drive the decision whether or not to get certified before this deadline. Based on the considerations above, ‘new’ players in the medical devices market have two options when filing before the transition deadline. Filing under MDD 93/42/EEC – daredevils only? This strategy is an option if your device will fall within a higher risk classification under the MDR. Classification remains mostly the same under the MDR, but some definitions and basic principles imply major changes. For instance, reusable surgical instruments will fall within a higher risk class and will require a notified body audit before market approval. In addition, the rules for software as a medical device have changed. Where most software applications are classified as the low risk class I, software under the MDR can fall within any risk class, with class I now being the exception. Therefore, it is highly recommended to do a thorough assessment of the current and future classification of your device(s). A higher risk classification means more (clinical) data, more control mechanisms and a more complex conformity assessment process. This makes the idea of a submission under MDD a tempting option. However, be aware that time is running out. Notified bodies are already closing doors regarding audits under MDD. The higher the risk classification, the sooner you need to submit your technical file. The lowest risk devices should be submitted before the summer of 2019 in order to get certified. In short, filing under MDD can be done, but companies need to consider the cost and also the time margin for error, in case bad audits or other unexpected obstacles prevent them from making the deadline. The first notified bodies will be designated to the MDR starting Q1, 2019. That means that submissions under the European MDR are already possible. However, many major notified bodies will not be designated to the MDR until sometime between June and October 2019. Once that happens, EU notified bodies will surely direct more of their resources towards the tsunami of MDR applications that will occur thereafter. As a company, you will not be bothered by the hard transition deadline, but mainly by your preferred market entry date. That does buy some time, but one should keep in mind that the submission file is not the final destination in the process. You have more time to gather all clinical evidence for your Clinical Evaluation Report and to develop proper Post Market Surveillance (PMS) and Post Market Clinical Follow-up (PMCF) plans. 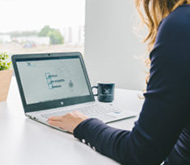 In addition, your Quality Management System (QMS) can be fully adapted to the ISO13485:2016 requirements (deadline in March 2019). This is a significant investment of resources and time, but for a good cause. 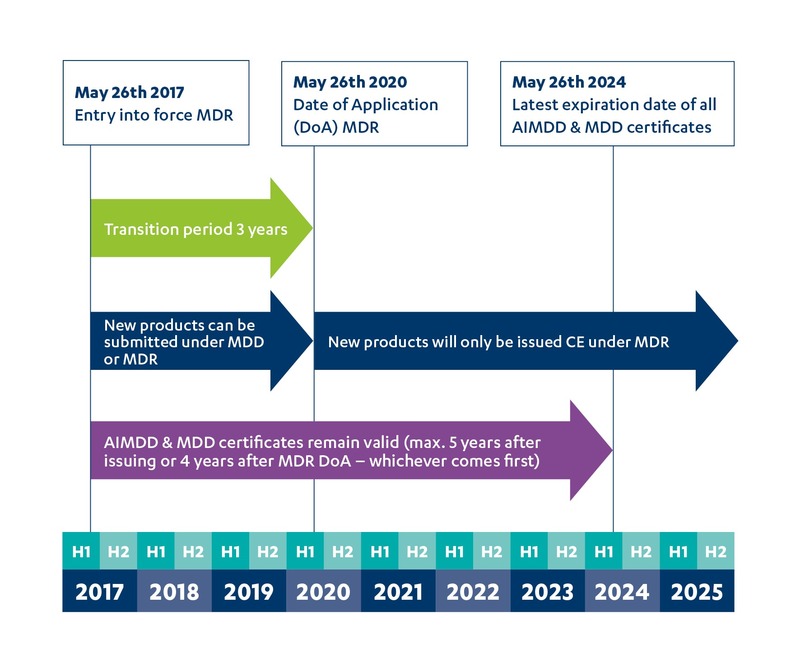 Companies that comply with the MDD must eventually comply with the MDR no later than May 2024, since all MDD certificates issued before May 2020 will expire as from that month. Start-ups that have made the transition earlier, will gain more experience with PMCF and PMS and the Unique Device Identifier (UDI). Another advantage is that stakeholders and customers will put more trust in your company and its devices, including their safety and traceability, when already available in the obligatory EUDAMED database. My conclusion? If your company has the resources available, if you have gathered sufficient clinical data and the business model allows for market entry before May 2020, it’s wise to start filing your devices under the MDR 2017/745. If the context of your company renders MDD submission as the preferred option, the effort is merely postponed. Last but not least, whatever option you choose, make sure to gather specialists and quality professionals around you to make the right choices. After all, we are talking about a key transition in the medical device world. It would be a pity to miss the train. To learn more about the main differences between MDD and MDR, read our whitepaper about the Medical Devices Regulation.